The weekend of June 7 and 8 provided a fantastic opportunity for the residents of our lovely village to come together and play host to over 1,000 paying visitors for Bramshott Open Gardens 2014. The weather threatened us all week, but in the end the rainclouds cleared and the sunshine arrived as Damian Hinds cut the ribbon at midday on Saturday to officially open the event. From that moment Bramshott was bathed in glorious English summer sunshine for the whole of the weekend. 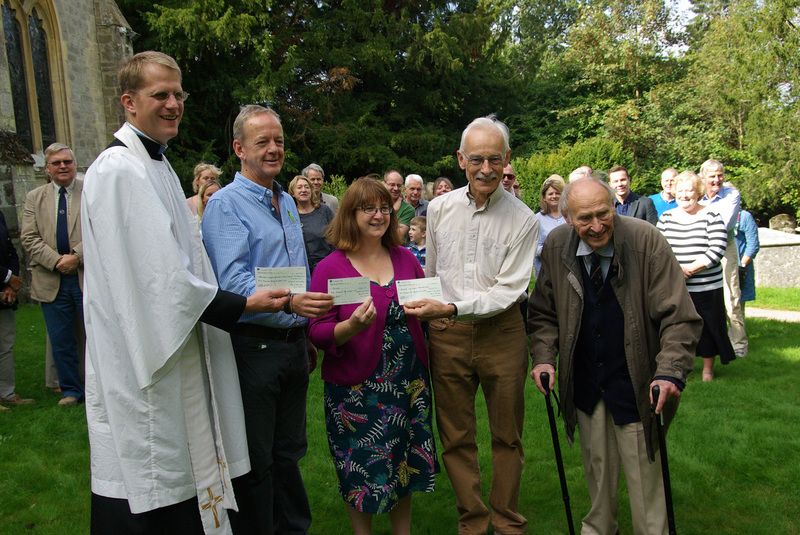 Thanks to the record-breaking visitor numbers and the tireless efforts of over 100 gardeners and volunteers over the weekend, Open Gardens 2014 raised a magnificent £11,176!! This total includes the generous contribution of £500 from the memorable (inaugural!) Bramstock festival the weekend before (thank you Cathy Austin), and the profits from Live’n’Local in September 2013. So, allowing for allocated costs and a retainer for 2016, this should leave us with over £10,000 to donate to our chosen local good causes. As in previous years, the majority of this pot will be split three ways between St Mary’s Church, Macmillan Cancer Care, and the Bramshott Sunken Lanes Conservation Project. More than anything of course, the weekend was a fantastic celebration of our vibrant community spirit, and this was certainly reinforced and endorsed by the warm smiles of our visitors, and the kind remarks and compliments they paid to us all. And what a weekend it was… We set new records in all sorts of ways (besides sheer visitor numbers) and the whole village can be proud that we put on such a fantastic show, brilliantly organised by the committee, with the help of so many willing volunteers and helpers. A really exceptional achievement, and many, many thanks are owed to everyone who contributed, especially the organising committee, consisting of Tony Rudgard, Craig and Lu McGregor, Rita and Chris Holden, Kay Murray, Cathy and Jeremy Scholfield, David Levy, Annie Hill, Mike and Mandy Knowles, Phil Simmons, Angela Glass, Ken Lucking, Zoe Wright, Claire Ridge, Tony Griffiths, Michael Smyrk, Will Fairhurst, and Richard Loversidge. Thank you also to all the gardeners – 26 in all! – who worked so hard to create such inspiring and beautiful gardens, and also provided much-needed refreshments for our visitors. Without you, we literally wouldn’t have an Open Gardens! The Flower Festival display in St Mary’s, organised by Peggy Greaves, was glorious, as was the magnificent Scroll of Remembrance created by Mary Eyre. So…well done Bramshott….we can all now look forward to Open Gardens 2016!